We believe passionately that YOU and your salon team have the power to transform your Salon Business. The salon coach may support individual salon managers, salon owners or in most cases he is commissioned by salon owners to help develop the whole salon team, working with them closely to improve performance. The Salon Business Coach brings out ability by identifying needs and planning and implementing suitable training programme's. Whatever the context, coaching involves developing the teams' psychological fitness as well as developing the real skills needed to ensure profitable salon business growth. When you hire the salon business coach you are inviting a business development expert into your salon to work with you and your team; as part of your team, an integral part of your business development strategy. Deciding that you need an extra pair of experienced business development hands is a sign of strength and demonstrates great leadership on your part. Life and business should not be a struggle. Call in the Salon CEO for a little extra help. Salon Business owners have invested considerable time, money and emotion into their Salon Business. To protect this investment the salon owner should consider reviewing their Salon Business strategy to ensure their stability today and their steady growth into the future, to do this with short, medium and long term goals. Most salon owners will agree that they have invested huge resources into creative training but have invested very little, if anything into teaching salon management and salon staff how to be productive, how to contribute more and take personal responsibility for helping to grow the business. Our world is changing. Today you have to work in a different way, your salon business has more pressure on it now than at any other time in history to be legally compliant with human resource and legislative management and to manage your staff in a way that has respect and integrity for them but forces them to be more productive and to contribute more than just "turning up" and servicing the clients that you have brought in to the business. Full Column has developed training programs to eliminate the complacency, fear, taboo's and skills gaps that are prevalent with salon staff today. These will secure your business for the future. Our stylist training courses have been engineered to teach salon staff to understand and act on the knowledge that it is part of their professional contract with your salon that they should work diligently towards filling their own column with profitable clients. We have also engineered salon management training courses and the "salon business tools" that are needed for effective salon management essential in today's evolving salon business environment. To survive today and to grow in the future salons need to develop short, medium and long term goals. Take immediate control to increase the fast paced metabolism of the salon team, there are methods you can employ that will have an immediate effect and will increase salon revenue quickly. In the first instance you must ensure that each team member has the skills and confidence to begin to increase their personal column revenue client-by-client and day-by-day. Treat every employee as an individual "profit centre" and give them the skills they need to contribute more to your Salon Business. 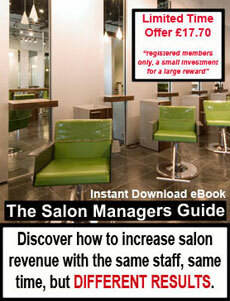 Salon staff will rarely work to 100% of their capability unless salon management make this happen. If there is no system in place for measuring productivity, staff assessment, career progression and reward most staff will remain average 9-to-5ers and their employers will never generate the income they hoped for. Around 80% of the staff that work in salons settle for ok and "good enough" and salon management allow this to happen because neither they nor their staff have had the training needed to develop the essential business functions that are necessary for continuous profitable growth. This can be easily fixed with simple training. Each member of your salon team is different, and the majority of them have the ability to be super productive if only they knew how and then had the confidence to apply that knowledge for the benefit of clients and the to the benefit of your bank balance. They are creative stylists and therapists that provide fantastic service and style for your clients; however they have the ability to be super productive stylists and therapists that are revenue aware and business focused. To capitalise on the short and medium term goals for improved productivity, turnover and client numbers it is necessary to engineer a long term Salon Business Development and Human Resources Strategy. 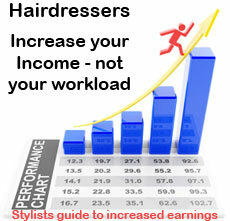 What price do you put on profitable growth for your Salon Business? To fast-track the entire salon team to become Salon Business Development Managers see the Salon Business Accelerator Program.